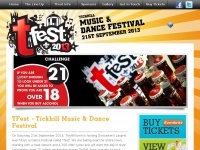 Tickhill TFest is a family friendly music festival set in the stunning historic village of Tickhill, Doncaster. 1 review has been written for T-fest.co.uk yet. I am sure they are great fun , in a field , miles from residential homes. But to start at 12 midday untill 11pm in a area where the houses are next door or even 1/2 a mile away, where my windows vibrate. I cant hear my tv or have to listen to it for 11 hours, thumping. Sorry they should not be held near housing estates. two profiles were found for T-fest.co.uk in social networks. Among other social networks the website is represented in Facebook and Twitter. The web server used by T-fest.co.uk is run by Microsoft Limited and located in Great Britain. There are many websites run by this web server. The operator uses this server for many hosting clients. In total there are at least 202 websites on this server. The language of these websites is mostly english. The T-fest.co.uk websites were developed using the programming language ASP.NET and served by a Microsoft-IIS server. The website uses the latest markup standard HTML 5. The website does not specify details about the inclusion of its content in search engines. For this reason the content will be included by search engines.